While my dad was here for the weekend he built a swingset for Robyn and Finn. Now, I know you’re probably picturing the typical 8 foot A-frame, complete with chains and plastic seats. 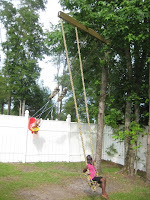 In classic Shepherd fashion, this swingset is on a much grander scale. (Shepherd rule # 47 – all projects must be BIG, really, really BIG.) 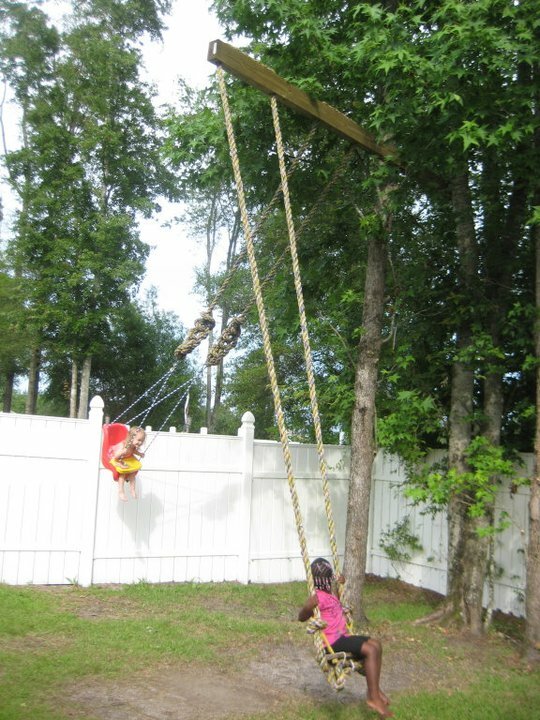 And, in order to accommodate my husband’s desire not to have anything in the yard to mow around, my amazing father devised a way to build a swingset with no legs – I repeat – no legs. Now, you must remind yourself that I lived in 2 school buses when I was young. Dad found a way to turn them into a home of sorts, complete with a couch in the “living room,” makeup lights around the rearview mirror, and a rainwater shower on the back porch; literally a shower of cold rainwater, not one of those fancy showerheads that simulate rain. (Shepherd rule # 1 – Use it up, wear it out, make it do, or do without.) Which seemed to be at odds with my mother’s rulebook when she stated the now infamous ultimatum, “ok, I will live in a school bus, but I will not LOOK like I live in a school bus.” Thus the makeup lights. This may seem bizarre in your world. But in my world of school buses and rain water showers, this is just a normal swing. Maybe even a little scaled back from the swings I had growing up. My two favs were both of the rope and tree variety. The first was on a limb about 20 – 30 feet up a tree, which, if I remember correctly, Jerome Ocker, ascended in a matter of mere seconds in a strangely monkey-like manner. Jerome, if this incorrect, I apologize, but we’re talking about a 7-year-old’s perspective here. This swing was a loop of rope with a wooden seat. Set at the bottom of a hill, I would grab the swing and run up the hill, hop on the seat and go for a ride. Now sitting quickly progressed to standing, flipping, and trapeze style tricks that ended with a trip to the hospital after I landed on my neck and head – just a sprain. It didn’t slow me down for long. Okay, that one may sound impressive, but this next one is over-the-top. Picture a deep, deep ravine. I don’t know how deep, but in my memory it is over 100 feet deep. Dad must have spotted the perfect branch for a swing, because I got home from school one day and he was standing at the top of the ravine with a weight on the end of a long, thin rope. About 1/3 of the way down the hill was this extraordinarily tall tree. Roughly 60 feet up was a strong, thick branch sticking out straight as an arrow. Dad must have spent an hour or so tossing the weight, trying to get it over that branch. Then he used the thin rope to pull a very thick rope up and over the branch. To take a ride on this enormous pendulum, one had to grab ahold of a rope tied to the bottom of the swing, hike up the hill, and then ascend a 12 foot homemade ladder to a platform at the top. Once you got to the platform, you used the small rope to pull the swing to you, then you would reach up as high as you could, lean out over the abyss, and once you got a good, tight grip you would squeeze your eyes shut and leap out into the atmosphere and quickly straddle the rope, hoping that your little caboose landed on the stop sign shaped piece of wood that made up the seat. Now THAT was a swing! No roller coaster can compare to the stomach drop that I would experience as I sailed out over the ravine, the ground dropping away beneath me, my hair whipping in the wind, screaming and laughing simultaneously. To this day, swinging never fails to make me smile. So thank you daddy for the great, ingenious swing that meets Charles’ criteria, brings back such fun memories of my childhood, and entertains the kids for hours on end! Does it get any better than that?